Put the BOM BOM, apple whiskey, cinnamon whiskey, cinnamon, nutmeg, and ice in a martini shaker or mason jar. Cover and SHAKE YOUR BOM BOM!! Strain and pour into martini glasses, and garnish each glass with a cinnamon stick. 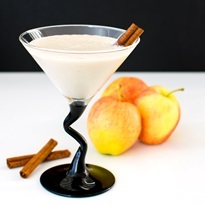 For 1 to 2 Servings: I used ½ cup creamy dairy-free liqueur, 1 tablespoon apple whiskey, 1 tablespoon cinnamon whiskey, and a pinch of each spice to make 1 large martini or 2 small ones.